What Are The Best Ways To Maintain A Clean Bathroom? Have you ever visited a friend and marveled at the cleanliness of their bathroom? How do they do it? Do they spend hours on their hands and knees scrubbing the tiles and shower walls? Do they wave a magic wand and all of a sudden soap scum disappears? They probably know the best ways to maintain a clean bathroom and after learning our tricks and tips, yours will be even cleaner. When it comes to your bathroom, it’s easier to split your cleaning tasks into three groups: daily, weekly and monthly. This ensures that you’re not stuck with a messy sight every time you go to brush your teeth. Keep disinfectant wipes or spray under your sink so that if a sudden mess comes up, you can eradicate it right away. After every shower wipe down the shower walls with a squeegee to keep moisture out. Moisture builds up in your bathroom very easily so if you do have a window in there, open it a tad to let air out. Also, every night as soon as you are finished brushing your teeth, take a quick minute to wipe the bathroom mirror. This will remove toothpaste, watermarks and spittle and can be done with a paper towel or even one of the disinfectant wipes you’re now keeping under the sink. Finally, use liquid soap instead of bar soap for handwashing. Bar soap can attract germs and grime and excess water can build up in the soap dish creating a soupy mess. With liquid soap, the soap is pumped directly onto hands with little to no mess. Towels can become moisture magnets if they’re hung up in a smaller space, so if you keep your shower towels in your bathroom, make sure that you change them weekly (or more if they are not drying properly). As for your hand towels, these should be changed every three days. 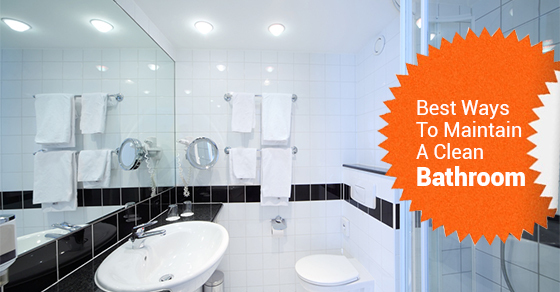 Additionally, you should be doing a top-to-bottom bathroom clean every week. This means cleaning the toilet bowl with a commercial toilet-bowl cleaner or chlorine bleach (about ¼ cup should do it), wiping down the sinks and faucets, and making sure you spray the shower with white vinegar or store bought cleaner. Once a month you will need to make sure the pipes are clear. To unclog your pipes and free them of hair, oil and grease, pour ½ cup of baking soda, followed by a ½ cup of white vinegar down your sink and shower drains. Let it stand for a few minutes then pour a cup of boiling hot water down the respective drains to wash it all away. You can also fill a plastic bag with white vinegar and place it snugly over your shower head. Secure the bag with a rubber band and soak overnight. This will remove clogs and mineral deposits that have formed. If you have kids who use bath toys, you can soak them in mixture of white vinegar and water to get them clean again. Just soak the toys for about 10 minutes then sponge them off before laying them out to dry. A little bathroom cleaning goes a long way, but you have a busy schedule and cannot fit in daily and even weekly cleanings, call us at Sunrise-Cleaning. We’ll clean your bathroom so well that it shines!